(CNN)This week President Donald Trump signed an executive order extending a presidential declaration of a national emergency concerning Somalia for another year, calling the Islamist insurgency plaguing that country an "unusual and extraordinary threat" to the US. But even if that is the last extension of the declaration, US defense officials say the mission in the country is likely to take years to complete. The fight there hinges on US Special Operations Forces being able to train an elite Somali army unit capable of defeating al Qaeda-linked militants on the ground. The commitment to the East African nation comes after the President has signaled a desire to reduce US troop levels across the globe and as the administration is in the process of withdrawing forces from Syria. While officials say the effort is making progress, they tell CNN that the US training mission is likely to not be completed until 2026. For nearly two years, a small team of US Special Operations forces has been embedded with the Somali National Army, assisting in the fight against the militant group Al-Shabaab. As well as advising on airstrikes and ground assaults, the Navy SEAL-led team's primary task is to train and build Somalia its own elite light infantry force. 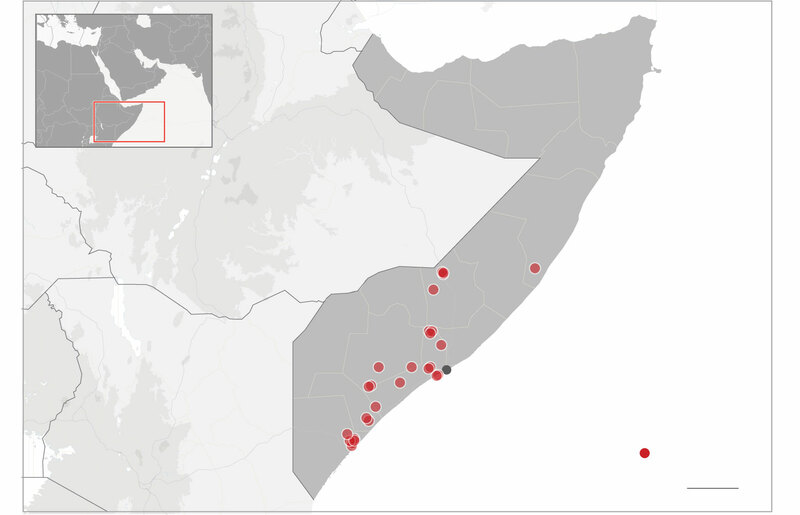 Named Danab, which in Somali means lightning, the force currently numbers only about 500 soldiers, too few to carry out operations in a country with a coastline almost as long as the east coast of the US. The plan, US defense officials say, is to eventually build Danab into a force of 3,000 soldiers capable of clearing militants from villages and towns across Somalia. "The plan is to build two companies a year, with the end-state being five battalions and a brigade headquarters element," Becky Farmer, a spokesperson for Africa Command which oversees US military operations on the continent, told CNN in a statement. "We think it's going to take approximately seven years for the Somalis to absorb all of these forces," a defense official familiar with the US counterterrorism strategy in Somalia told CNN. "If everything works out and however many miracles line up to make this happen it could go faster, and it could go slower," he added. A quarter century after the events surrounding "Black Hawk Down," the incident that killed 18 US soldiers in Mogadishu, the US military finds itself more actively engaged in Somalia than at any time since. Though the US has higher troop levels in Niger and Djibouti, Somalia is the only place in Africa where the US military is regularly carrying out airstrikes against enemy forces. The Pentagon has about 500 to 600 personnel in Somalia according to US Africa Command. While US military advisers have been in Somalia since at least 2013, the effort has gotten a major boost under the Trump Administration, which volunteered to undertake the Danab advisory mission in 2017 in addition to expanding drone strikes, and in December reopened the American diplomatic mission in Mogadishu for the first time since 1991. Trump authorized the military to carry out precision strikes targeting Al-Shabaab in March 2017. Prior to that the US military was authorized to conduct airstrikes only in defense of advisers on the ground. So far this year, at least 255 fighters from Al-Shabaab have been killed in 30 airstrikes, according to figures released by US Africa Command. In 2018 the US conducted 47 airstrikes targeting Al-Shabaab, killing about 337 militants. In 2017 the US carried out 35 airstrikes and in 2016 it conducted just 15. "The bottom line is we're taking formations and fighters and leaders off the battlefield. And that is having effect on the network," Brig. Gen. William West, the deputy director of operations for Africa Command, told CNN in a statement. The increase in airstrikes though has been criticized by some members of Congress and outside groups like Amnesty International, which has accused the US of killing civilians in Somalia. While the US military has rejected Amnesty's allegations, US Africa Command announced earlier this month that it had determined that one of its 2018 drone strikes had killed two civilians, the first ever such acknowledgment by the US military in Somalia. US military officials stress that the airstrikes are only one component of the US military's overall campaign in Somalia. "Every strike we take, whether it's on the pace that we're on this year or on the pace that we've been on in previous years, is all done in support of the strategy. And the strategy supports the goals of security and stability in Somalia," Maj. Gen. Gregg Olson, the director of operations for US Africa Command said in a statement to CNN. The administration regards the fight against the militant group Al-Shabaab in Somalia as critical to protecting America's primary strategic allies in the region such as Kenya and Ethiopia which have been hit by Al Shabaab-linked terror attacks in the recent years. The current strategy is partly a result of a May 2017 conference held in London, where a group of countries including the UK, US, Kenya and Ethiopia along with representatives from the UN, African Union and European Union, met to discuss the future of Somalia. For years the task of fighting Al-Shabaab in Somalia had fallen to the African Union-led peacekeeping mission, AMISOM. But in the months leading up to the London Conference, Al-Shabaab proved that it was still a potent force on the battlefield with its fighters overrunning three AMISOM bases, seizing weaponry, armored vehicles and ammunition. In London, a plan was agreed on that called for the creation of a regular army of 18,000 troops and 32,000 federal and state police to eventually replace the African Union-led peacekeeping mission, AMISOM which had spent years fighting Al-Shabaab. Then-Secretary of Defense Jim Mattis agreed that the US would take responsibility for "training specific numbers of proficient and mobile light infantry capable of defeating Al-Shabaab," referring to the Danab unit. The rest of Somalia's security forces were to be trained by international advisers from the EU, Turkey and the UAE on a bilateral basis. Coordinating that effort has been a challenge, US officials say, and has led to some less than stellar results. A State Department official told CNN that while there have been some successes in integrating Somali troops trained by Turkish and UAE advisers into the national army, many of the 6,000 Somali troops trained by the EU did not join the national army and "most of them have gone off to militias and local clans." "It is a work in progress," he added. The US military does attempt to coordinate these various efforts while also providing support to AMISOM troops via a military coordination cell that is led by a one star general in Mogadishu. Despite those previous misfires, US officials are confident that the focus of the US-effort, Danab, will stay loyal to the central government. "Ultimately, the Danab as a unit fall under the central Somali government and we have no indications of dual loyalty," Farmer, the spokesperson for Africa, told CNN. US military officials say that in the past Al-Shabaab has exploited local grievances among the many clans that make-up Somalia as a means of gaining power so the US has made a concerted effort to ensure that the forces comprising Danab are representative of the areas where they operate helping to gain the trust of the locals, something that could be contributing to the slow pace of increasing its size. "The Danab are clan-appropriate and integrated units of the Somali National Army, with one battalion aligned to each Federal Member State, in order to provide locally acceptable and trusted forces of the Somali National Army," Farmer said. "The indications we've received on the ground are that the Somali people hold the Danab in the highest esteem as a result of these efforts," Farmer added. American diplomats, military officers, and USAID officials all told CNN that they see progress in Somalia, with many citing increased security in major cities and towns and government reform efforts. Trump's extension of the emergency declaration came the same day Somalia's Prime Minister Hassan Khayre visited the White House for a meeting with Trump's National Security Adviser John Bolton. Khayre, who has been praised by American diplomats and USAID officials for his efforts to reform Somalia's economy and security forces, also visited the Pentagon Thursday. One major success is the town of Kismayo, which was recaptured in 2012 after it was once considered an Al-Shabaab stronghold. US officials say that the Somali security forces have managed to expand the security bubble around Kismayo out some 25 miles from the town. USAID officials told CNN that at least 1,000 families have returned to Kismayo. Still, the focus remains on securing the areas around the capital Mogadishu where Al-Shabaab, despite having been driven from the city, can still carry out terror attacks. An attack last month killed dozens. The hope is that eventually the elite Somali troops will be able to drive Al-Shabaab from strategic corridors and areas near the capital, and keep them from attacking Mogadishu. For now though, the Somalis are still heavily reliant on US forces, particularly for functions like planning and intelligence. "We're still involved in every single operation," a defense official told CNN. Though American advisers still accompany Somali troops out in the field, officials say they've taken steps to mitigate risks to US personnel. "We always work to stay no closer than the last line of cover or concealment and we only go outside the wire when we do not think contact is expected or likely," a US defense official familiar with US intelligence in Somalia told CNN. It can still be a dangerous mission. Last month the US called in an airstrike in Somalia's Lower Shabelle Region after a Somali-led force that was being advised by US personnel came under attack. The last US soldier that was killed in Somalia was in June 2018, US Army Sgt. Alexander Conrad was killed and three other soldiers were wounded by "indirect fire" after they came under attack while helping local forces set up the kind of combat outpost the US military sees as critical to its strategy in Somalia. The US military estimates that Al-Shabaab commands somewhere between 5,000 to 7,000 fighters and still controls about 20% of Somalia's territory. It's a far cry from Al-Shabaab's heyday when it controlled most of the country including the towns of Kismayo and Baraawe and even some parts of the capital, Mogadishu. "Folks in the United States, they think Blackhawk Down and things like that," a USAID official told CNN, saying that the country has made major improvements in recent years, thanks largely to the improved relationship between the US and Somali governments since the December re-establishment of the US diplomatic mission in Mogadishu, the first such presence since 1991. A big part of making sure the military gains against Al-Shabaab are sustained is ensuring that forces are able to hold the recaptured territory. Doing that requires a healthy dose of humanitarian aid. But the US development aid budget to Somalia is limited, at only about $60 million according to USAID officials. "We have a lean operation," one USAID official said. Things could get even leaner as the Trump administration's 2020 State Department budget request is seeking only $58 million in "Economic Support and Development Funds for Somalia, a decrease of some $15 million from the previous year. The US does also provide hundreds of millions of dollars in humanitarian aid to meet more short term emergency requirements like famine relief. And even if Al-Shabaab is defeated, officials say other security challenges remain. "It's not just Al-Shabaab, There are clan grievances here that go back hundreds of years, that has to be sorted out too," one USAID official said.